Link building is one of the most important elements of a viable SEO strategy. Yet it’s also one of the most difficult and time-consuming. Many people make the mistake of assuming that acquiring lots of inbound links is a goal and some even go so far as to buy links in bulk (a no-no) in the hopes that it will offer a shortcut. Link building isn’t that simple and sometimes a more nuanced approach can be beneficial, as evidenced by something we just noticed here at Econsultancy on our own website. While going through Google Webmaster Tools, we noticed that the page on the Econsultancy website with the highest PageRank (a PR7) is an interview we conducted with Jakob Nielsen. If you look at the backlinks for this page, you’ll notice that there aren’t a whole lot. But one looks to be quite important: a link from Nielsen’s website, which itself has a PR7. Of course, the fact that this single inbound link likely contributed to our page’s high PageRank almost singlehandedly won’t surprise an SEO; it makes complete sense. But it is a great reminder that when it comes to link building, sometimes less is more. You don’t always need to get tons of links to see a real impact; one great link can do a whole lot more than many average links. Depending on the type of site you operate and the particular SEO landscape you face, it may make more sense to approach link building as a nuanced rather than an indiscriminate exercise. This means looking at your content development and baiting the right links, targeting that content to high-value prospective linkers and focusing on a smaller number of targets instead of the web at large. This isn’t always easy and it may not always be possible but it’s well worth considering before you go out and try to get hundreds of inbound links from anyone who’s willing to provide them. Econsultancy will be presenting findings from the UK Search Engine Marketing Benchmark report at this year’s Search Marketing Expo London (@smx) on 18th May. Click here for details. Photo credit: existentist via Flickr. One of our big annual events is taking place in less than three weeks. It’s called The Future of Digital Marketing and promises to be a thought-provoking day out. In advance of the event we thought it would be good to ask some of our tuned-in Twitter followers for their insight. The response was great, with more than 50 people chiming in with suggestions, from Arabic bazaars to eyeball scanning to the colour puce. By now, just about everyone involved in online media has heard of the ‘Craigslist killer‘. 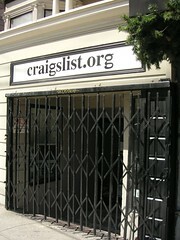 It’s a tragic story that has sparked a debate about Craigslist and the way it manages its online community. passionate arguments are made on both sides. As part of the social web movement, marketers are increasingly becoming publishers. There are few who are pouring as much into multimedia (i.e. video) web publishing as Wisconsin USA-based Drs. Fosters Smith. This seasoned, catalog-based direct marketer is investing in their own staff, production facilities and syndicating widely, on the Web with www.peteducation.com, and on national cable television. I sat down with their online chief, Gordon MaGee to understand how the company cost-justifies and measures its continued investment in online video.